Join ICA Dorothy and Stephen R. Weber (CHE’60) Curator Alex Klein on a public tour of her exhibition BIG OBJECTS NOT ALWAYS SILENT. ICA’s Public Curator-Led Tours offer a unique opportunity to learn about our current exhibitions from the curators themselves. These tours cover the overarching themes and broader contexts of the exhibitions, highlight key works, and give insight into the curatorial process. BIG OBJECTS NOT ALWAYS SILENT is co-curated by Alex Klein, the Dorothy and Stephen R. Weber (CHE’60) Curator at ICA; and Luca Lo Pinto, curator at Kunsthalle Wien in Austria, where the first iteration of the retrospective was initially conceived and presented by Lo Pinto last fall. The exhibition juxtaposes graphic patterns with abstracted, figurative paintings, creating a fully immersive environment that underscores the artist’s systematic dismantling of the hierarchy between design and fine art, and between three-dimensional form and two-dimensional representation. Alex Klein joined ICA in 2011 from Los Angeles. Upcoming projects at ICA include Broad Casting: EAI at ICA (2018) co-curated with Rebecca Cleman, Suki Seokyeong Kang (2018) co-curated with Kate Kraczon, and the multifaceted international research initiative I is for Institute. 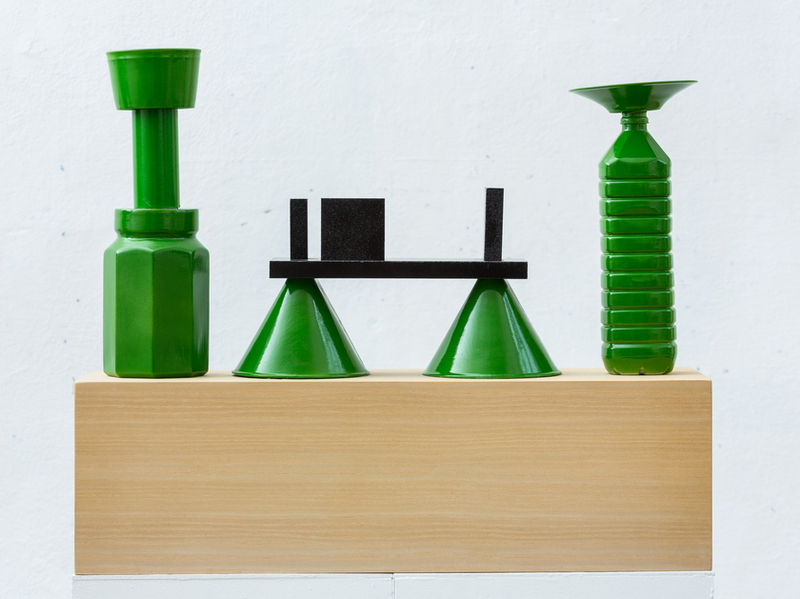 Recent exhibitions include a partnership with the Kunsthalle Wien, Austria to present the first retrospective of Nathalie Du Pasquier BIG OBJECTS NOT ALWAYS SILENT (2017) organized with Luca Lo Pinto Myths of the Marble (2017) co-curated with Milena Hoegsberg and co-organized with the Henie Onstad Kunstsenter, Norway and the multifaceted international research initiative I is for Institute. Other recent exhibitions include Barbara Kasten: Stages (2015), the first major survey of the artist’s work, which subsequently traveled to the Graham Foundation, Chicago and the Museum of Contemporary Art, Los Angeles; and Julia Feyrer and Tamara Henderson: Consider the Belvedere (2015), which partially travels to the Morris and Helen Belkin Art Gallery, Vancouver. She was also the curator of Excursus, an ambitious two-year, four-part exhibition, website, and programming series at ICA with Reference Library, East of Borneo, Ooga Booga, and Primary Information (2011–13) and co-curator of the exhibition First Among Equals (2012, with Kate Kraczon), which considered models of artistic dialogue, collaboration, and antagonism. Other projects at ICA have included AVANT-GARDEner: Ian Hamilton Finlay (2014, co-curated with Lynne Farrington); Vishal Jugdeo: An Education in the Logic of Leaves (2014); and the ICA Salon series (2011–14). From 2013 to 2015 she served as an agent in the Carnegie Museum of Art’s Hillman Photography Initiative where she co-curated the exhibition Antoine Catala: Distant Feel (2015, with Tina Kukielski) and co-edited the publication Shannon Ebner: Auto Body Collision (CMOA, 2015). Her writing has been published in numerous collections, including Public Servants: Art and the Crisis of the Common Good (MIT Press, 2016), The Human Snapshot(Sternberg Press/CCS Bard, 2013), How Soon Is Now? (LUMA, 2012), and the critical volume on photography Words Without Pictures (LACMA/Aperture, 2010), which she also edited. Klein received her MFA from the University of California, Los Angeles, her MA in the History of Art from the Courtauld Institute of Art, London, and her BA in Art History from Columbia University, New York. As an artist she has exhibited work in galleries such as Clifton Benevento (New York), Leo Koenig Projeckte (New York), Cherry and Martin (Los Angeles), Grice Bench (Los Angeles), and Galerie Crone (Berlin). She is also the co-founder, with designer Mark Owens, of the editorial project and publishing imprint Oslo Editions. Previously she held positions in the Wallis Annenberg Photography Department at the Los Angeles County Museum of Art, the Roski School of Fine Arts at the University of Southern California, and The Metropolitan Museum of Art, New York.